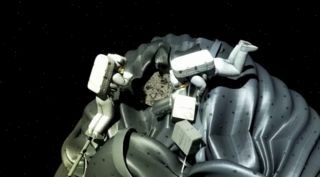 Two astronauts from a NASA Orion spacecraft venture on a spacewalk to explore an asteroid's surface and collect samples in this still from a video depicting the agency's Asteroid Retrieval and Utilization mission. WASHINGTON — A draft authorization bill from the House Science space subcommittee would cap NASA spending at about $16.87 billion for the next two years, prohibit a proposed asteroid retrieval mission, overhaul the agency’s management structure and raise the spending cap for Commercial Crew activities while increasing congressional oversight of the program. The bill, as Republican lawmakers have been hinting during House Science, Space and Technology Committee hearings all year, also aims to steer the nation’s human spaceflight program back to the moon and provide more money for robotic exploration of the solar system at the expense of NASA’s Earth observation program. The House Science space subcommittee will discuss the bill in a hearing on Wednesday (June 19). The Senate Commerce Committee, meanwhile, is “not too far behind” its House counterpart in finishing its own version of the next NASA Authorization bill, Ann Zulkowsky, a senior aide in the Democrat-controlled Senate, said June 14 at the Aerospace 2013 conference in Arlington, Va., organized by Women in Aerospace. The House Science space subcommittee’s bill includes many prescriptions for NASA’s human spaceflight program and would codify that Mars, by way of the lunar surface, is a priority destination for human explorers. "It is the policy of the United States that the development of capabilities and technologies necessary for human missions to lunar orbit, the surface of the moon, the surface of Mars and beyond shall be the goals of the Administration’s human spaceflight program," the bill states. An asteroid retrieval mission, proposed by NASA in April as part of the White House’s 2014 budget request, has no place in that framework, according to the draft bill. Another provision of the draft authorization bill that originated with House Republicans is an overhaul of NASA’s leadership structure. The proposed changes would give Congress greater influence over the selection of the NASA administrator, and give the administrator a six-year term. The NASA administrator is currently a political appointee who serves at the president’s pleasure. The House Science Committee’s draft bill calls on NASA to make sure that does not happen. The bill would require the space agency to evaluate the Commercial Crew Program’s prospects for making the 2017 deadline under annual funding levels ranging from $500 million to $800 million. The bill also establishes strict reporting requirements for the Commercial Crew Program, requiring NASA to brief Congress on the effort every 90 days, beginning 180 days after the bill becomes law. In a related provision, the bill places a $50 million cap — to be exceeded only with permission from Congress — on Space Act Agreements, an alternative procurement mechanism NASA uses routinely. The current round of the Commercial Crew Program is funded with $1.1 billion worth of Space Act Agreements. However, NASA has already said it does not plan to use Space Act Agreements for the program’s next development phase. The House subcommittee’s bill would authorize about $1.2 billion for Earth Science in 2014 and 2015 — about 30 percent less than the division’s budget in 2013 and 2012. The main beneficiary from this rebalancing would be the Planetary Science Division, which runs NASA’s robotic solar system exploration program. — Top Line: $16.865 billion, about even with NASA’s 2013 appropriation and roughly 5.1 percent less than what NASA got in 2012 in its last unsequestered spending bill. — Exploration Systems: $4.007 billion, 8.9 percent more than what NASA has proposed spending in 2013 under an operating plan it delivered to Congress in May, and 8.1 percent more than in 2012. — Space Operations: $3.818 billion, 2.5 percent more than the NASA-adjusted level for 2013 and 8.8 percent less than in 2012. — Science Mission Directorate: $4.627 billion, 3.2 percent more than in 2013 and 8.8 percent less than in 2012. — Cross-Agency Support: $2.6 billion, 4.1 percent less than 2013 and 13.2 percent lower than in 2012. — Aeronautics Research Mission Directorate: $566 million, 6.8 percent more than in 2013 and 0.6 percent less than 2012. — Space Technology Mission Directorate: $500 million, 21.9 percent lower than in 2013 and 12.9 percent lower than in 2012. The bill would transfer some of the human spaceflight research and development funding now managed by this directorate back to the Exploration Systems account. — Education Mission Directorate: $125 million, 7.8 percent more than in 2013 and 8.2 percent less than in 2012. — Construction and Environmental Compliance and Restoration: $587 million, 9.3 percent less than 2013 appropriation and 18.7 percent more than in 2012. — Inspector General: $35 million, about flat compared with 2013 and 8.6 percent lower than 2012. — SLS: $1.772 billion, of which $1.454 billion would be for rocket development and support work, and $318 million would be for SLS ground systems. That puts vehicle development and support about 6.1 percent higher than in the 2013 operating plan and 2.9 percent lower than in 2012. Ground systems, meanwhile, would be authorized for 15.2 percent less than in 2013 and 4.4 percent more than in 2012. — Orion Multi-Purpose Crew Vehicle: $1.2 billion, 7.7 percent more than in 2013 and even with 2012. — The James Webb Space Telescope, meanwhile, would be authorized for $658 million in funding in 2014 and 2015, which are peak development years for the long-delayed, overbudget astrophysics flagship. The proposed authorized level is 4.9 percent more than 2013 and 26.9 percent more than in 2012.